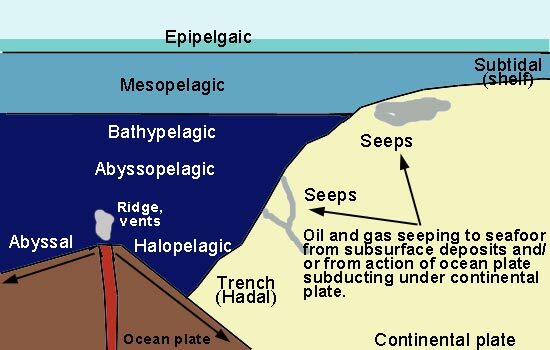 by Paul H. Yancey, Ph.D.
Life in the deep sea must adapt to unique conditions of low or no light, high pressure, low energy (except at hot vents and cold hydrocarbon seeps), and near-freezing or - at hot vents - superheated temperatures. One unexplained but fairly common feature of deep animals is gigantism - such as oarfish, the giant squid, etc. Amazingly, less than 1% of the deep sea has been explored. What might be left undiscovered?